A practice where mastering the appointment schedule reduced no-shows by 70% and decreased overtime payroll cost by $60,000 per year. A practice that doubled time-of-service collections within 30-days once staff members once staff learned new collection techniques. A simple formula for determining the hassle factor in dealing with 3rd party payers. An amazingly productive physician generated $600,000 more in revenue than the national benchmark for his specialty. A practice’s team approach to get exceptional results from their billing service. BONUS: The NEW 3rd edition includes 46 downloadable toolbox forms (in Word and in PDF) designed to help you manage your busy practice. These forms can be customized for any practice and cover workflow, business analysis, and human resource management. Just as doctors need to stay up-to-date with the best practices in patient care, their practices need to keep up with the real-life solutions that can keep their practices healthy. 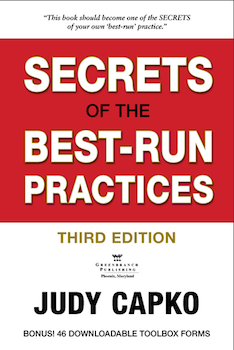 The all-new 3rd edition of SECRETS OF THE BEST-RUN PRACTICES is a cost-effective investment in practice success.